↑ Tyson, Neil deGrasse and Donald Goldsmith (2004), Origins: Fourteen Billion Years of Cosmic Evolution, W. W. Norton & Co., pp. 84–5. ↑ "The Cosmic Horizon" (2007). Monthly Notices of the Royal Astronomical Society 382 (4): 1917–1921. doi:10.1111/j.1365-2966.2007.12499.x. Bibcode: 2007MNRAS.382.1917M. ↑ "The Cosmological Spacetime" (2009). International Journal of Modern Physics D 18 (12): 1889–1901. doi:10.1142/s0218271809015746. Bibcode: 2009IJMPD..18.1889M. ↑ This is usually quoted as 60 e-folds of expansion, where e60 ≈ 1026. 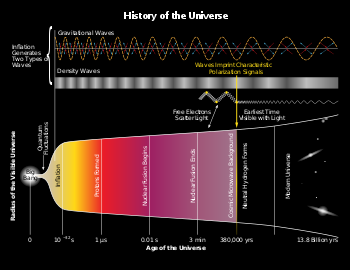 It is equal to the amount of expansion since reheating, which is roughly Einflation/T0, where T0 = 2.7 K is the temperature of the cosmic microwave background today. See, e.g. Kolb and Turner (1998) or Liddle and Lyth (2000). ↑ See Kolb and Turner (1988) or Mukhanov (2005). ↑ Kofman, Lev (1994). "Reheating after inflation". Physical Review Letters 73 (5): 3195–3198. doi:10.1088/0264-9381/3/5/011. Bibcode: 1986CQGra...3..811K. ↑ Carroll, Sean M. (2005). "Does inflation provide natural initial conditions for the universe?". Gen. Rel. Grav. 37 (10): 1671–4. doi:10.1007/s10714-005-0148-2. Bibcode: 2005GReGr..37.1671C. ↑ "Inflation without a beginning: A null boundary proposal" (2003). Physical Review D 67 (8). doi:10.1103/PhysRevD.67.083515. Bibcode: 2003PhRvD..67h3515A. ↑ "Steady-State Eternal Inflation" (2002). Physical Review D 65 (8). doi:10.1103/PhysRevD.65.083507. Bibcode: 2002PhRvD..65h3507A. Linde, Andrei (2005) "Inflation and String Cosmology", eConf C040802 (2004) L024; J. Phys. Conf. Ser. 24 (2005) 151–60; arXiv:hep-th/0503195 v1 2005-03-24. Lyth, David H. (1999). "Particle physics models of inflation and the cosmological density perturbation". Phys. Rept. 314 (1–2): 1–146. doi:10.1016/S0370-1573(98)00128-8. Bibcode: 1999PhR...314....1L. hep-th/0311040 David H. Lyth: Which is the best inflation model? Max Tegmark's Our Mathematical Universe (2014), "Chapter 5: Inflation"